Zhou Yongkang’s case ties in with Xi Jinping’s larger vision for the rule of law in China. 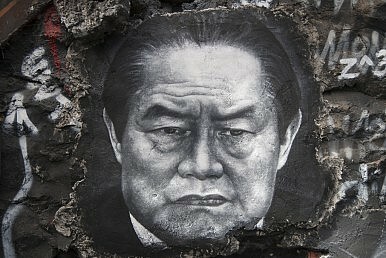 Yesterday, the news broke that China’s Central Committee has officially placed Zhou Yongkang, a former Politburo Standing Committee member, under investigation for “serious disciplinary violations.” As befitted such a high-profile (and long expected) move, the Chinese Communist Party carefully controlled the timing and the official coverage of the news. CCP official messaging so far suggests that Zhou’s downfall will be hailed not only as a coup for the anti-corruption campaign, but more importantly as a victory for the “rule of law” in China. The announcement about Zhou Yongkang came along with news of the upcoming fourth plenary session of the CCP’s 18th Central Committee, which has been scheduled for October. In fact, news about the fourth plenum edged out even the Zhou story on Chinese official media, including the the Wednesday edition of People’s Daily. The simultaneous coverage of these two stories makes it clear that they are meant to be considered in conjunction with one another. Thus, it’s no coincidence that the just-announced focus of this year’s plenum will be the rule of law. News of the upcoming plenum was the lead item on CCTV news Tuesday—topping the announcement of the investigation into Zhou Yongkang. CCTV quotes extensively from the official report regarding the upcoming plenum. Xi Jinping and company have decreed that “governing the country according to the law” is crucial for achieving a number of high-level Party goals: establishing a moderately prosperous society in China, realizing the “Chinese dream,” and carrying out the “comprehensive” reforms Xi has planned for China’s economy. Even more importantly, Xi argues that establishing the rule of law is crucial for increasing the Party’s ability to rule China. For Chinese leadership, promoting the rule of law does not mean divesting the legal system from Party control—just the opposite, in fact. As already hinted by previous announcements on legal and judicial reform, what Xi means by the rule of law is actually strengthening Party control but (crucially) only at the central level. Current legal reforms are aimed at making sure local officials cannot interfere with the courts to get around central edicts (especially painful economic and environmental reforms). China’s leaders are also aware that the Party’s image suffers when local officials pervert justice for their own ends. While Xi envisions a legal system ultimately beholden to the Party, he wants the system to be in the hands of Beijing alone, rather than subject to the whims of local bureaucrats. Xi also seeks to create a Chinese Communist Party where no single member is above the Party as a whole—and this is where his idea of the rule of law intersects with the fate of Zhou Yongkang. Already, official state media are extolling the investigation into Zhou Yongkang as a victory for the rule of law in China. An op-ed in People’s Daily (an abbreviated English version of which appeared on Xinhua) said that Zhou’s downfall proves there are no exceptions to Party discipline. “Officials and Party members will eventually pay their price if they unscrupulously pursue their selfish desire, abuse their power or seek personal interests,” the article said. People’s Daily praised the “political courage” of the decision to go after Zhou, which is hailed as proof that all Party members are equal under the law. The gist of the article is that the fate of China depends on the successful implementation of the rule of law within the CCP. The country depends on the Party, People’s Daily writes, but to effectively govern China, the CCP must first effectively govern itself. Given that Zhou Yongkang’s case is already being held up as a victory for the rule of law, it would be a shock if his case didn’t wind up in court. What little historical precedent we have backs this up — Caixin notes that every former Politburo member accused of “serious discipline violations” (notably Chen Liangyu, Bo Xilai, and Xu Caihou) has ended up in court. While Zhou would be the highest-ranking CCP member to ever face such treatment, now that he has been officially tabbed for investigation there is no reason to think he will be an exception. And here’s another place where the rule of law with Chinese characteristics comes through: Zhou’s case, should it wind up in court, is already decided. There is no chance of him being found innocent in a court of law, just as there’s no chance that the just-announced Party investigation will come up empty-handed. Once the CCP invokes the importance of the rule of law, the guilty verdict is already in. Zhou’s fate was sealed once Xi had the political support to take him down. In the end, what Xi means when he speaks of the rule of law is not the same as the Western concept. A more accurate term would be the rule of the CCP through the law. The CCP still controls the legal system, but uses it as one of many available tools to enforce edicts from the center. That means the Party will have more options for disciplining unruly members, whether local officials or high-ranking members who overstepped their bounds. It also means that the CCP can and will continue to use the legal system to imprison political activists and dissidents seen as dangerous to its continued rule. No individual Party member is exempt from the law, but the Party as a whole is above it.